Samsung dropped a bombshell this week announcing the Galaxy J2 Pro, a 5-inch mid-range Android smartphone that’s exclusive for India. What makes the announcement surprising is the fact that it has not been long since the South Korea tech giant unveiled its Galaxy J2 (2016) in the country, according to Android Authority. The inclusion of “Pro” in its name is due to the bump in RAM and ROM, with the newly announced phone rocking 2GB of RAM and 16GB of internal storage as opposed to the standard J2’s 1.5GB RAM and 8GB built-in memory. Other specs and features remain unchanged, with the Samsung Galaxy J2 Pro sporting the same 5-inch HD Super AMOLED display with 720x1280 screen resolution, 1.5GHz quad-core Spreadtrum SC8830 processor and 2,600mAh battery found in the J2. The Samsung Galaxy J2 Pro has a micro-SIM card slot and a microSD card slot that can accommodate up to 128GB of external memory, Gadgets 360 reported. In terms of connectivity, the J2 Pro comes with Bluetooth, Wi-Fi, GPS, 3G and 4G capabilities. Camera technology is decent, with the new smartphone packing an 8-megapixel back camera and a 5-megapixel front-facing shooter. Since the Samsung Galaxy J2 (2016)’s selling point is Samsung’s unique Smart Glow notification ring at the back of the device, the Pro version will also come with the same feature that enables users to assign colors to notifications of different apps and contacts. Other special features of the device include the S Bike Mode, Turbo Speed Technology and Ultra Data Saving mode. The phone, which runs on Android 6.0 Marshmallow, is only exclusively available at Snapdeal. It costs INR 9,890 or $150, according to GSM Arena. 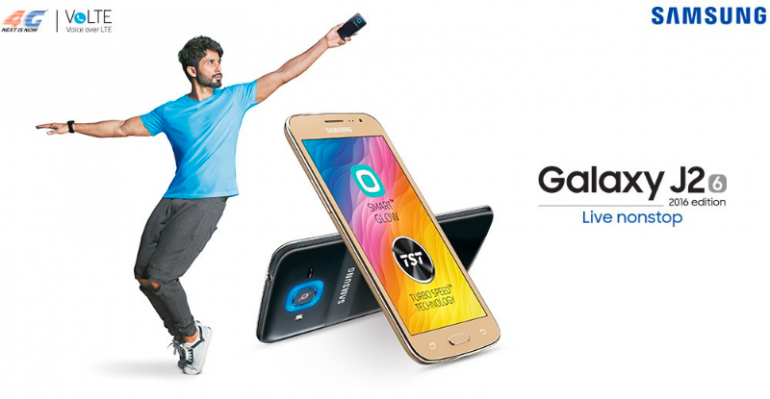 The launch of the Samsung Galaxy J2 Pro comes after the release of the Galaxy J Max in India and the Pro versions of the Galaxy On5, On7 and Galaxy J3 (2016).